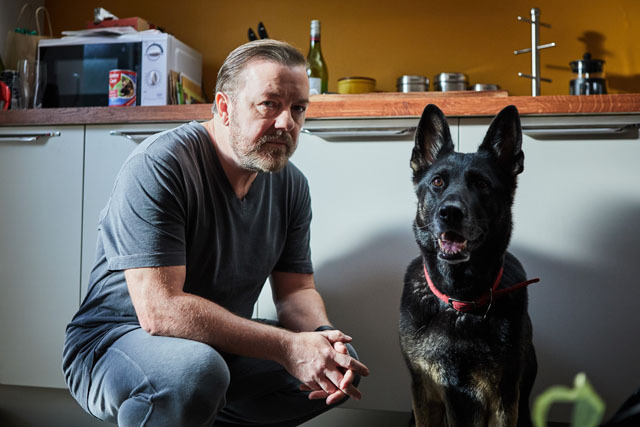 After Life is the new comedy-drama from Ricky Gervais and follows Tony (Gervais) as he tries to come to terms with the death of his wife Lisa (Kerry Godliman). Tony has already tried to kill himself as the show begins and we learn that he couldn’t go through with it because of the sad look in his dog’s eyes. Tony has decided that as life isn’t worth living anymore that he is now going to be brutally honest about everything. He is rude and insulting to almost everyone and it’s in these moments that the comedy aspects come through although they are all tinged with the pain Tony is feeling inside. Much of the comedy also comes from Tony’s job as a local newspaper features editor. Stories include ‘fat kid who can play two recorders with his nose’ and a damp stain that looks like Kenneth Branner. If you are offended by strong language then you may want to avoid as the C word is used quite liberally. You can tell from the off that Tony is lost, he can’t look after himself or his loyal hound very well and you can really feel the despair he is feeling throughout. After Life is a moving portrayal of grief and how it can hit you like a sledgehammer. The show does a great job of showing things not only from Tony’s point of view but also from the people around him who are trying to help. He strikes up some interesting relationships with his postman, a homeless drug addict and a prostitute all with surprising, sometimes sad, sometimes hilarious moments. Throughout the show, Tony also tries to take his own life several times but each time is saved by his dog who seems to be his only anchor to the living world. After Life can be tough to watch at times given the sensitive subject matter at hand. At no point is it disrespectful to anyone who may be going through something similar and is a stark look at what other people might be going through in their own lives. After Life also stars Penelope Wilton (Downton Abbey, Doctor Who), David Earl (Cemetery Junction, Derek), Joe Wilkinson (Him and Her), Kerry Godliman (Derek), Mandeep Dhillon, Jo Hartley, Roisin Conaty, Tim Plester and Diane Morgan (David Brent: Life On The Road). The series is a Netflix original series from Derek Productions. Charlie Hanson is producer and Ricky Gervais and Duncan Hayes are executive producers. For more information visit www.netflix.com/afterlife. I wholeheartedly recommend you go and watch After Life now.